CALL US NOW IF YOU ARE HAVING ISSUES WITH YOUR WHIRLPOOL REFRIGERATOR! We are open 24/7. A refrigerator is a very complex piece of machinery. We take it for granted, though, rarely considering the heavy workload place on the parts that work together to keep food cold twenty four hours a day, seven days a week. When something goes wrong, it can come as a shock. Fortunately, if you act fast, a broken part or malfunction in your Whirlpool refrigerator doesn’t have to cause a major inconvenience for your family. 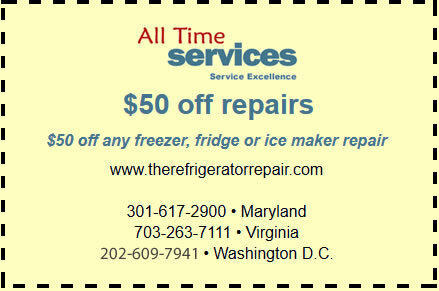 For immediate Whirlpool refrigerator repair services in Virginia and the greater Washington D.C. area, call All Time Services today. No matter what the problem may be, if you have concerns about how your fridge is currently operating, call us right away to set up an appointment with a professional technician, trained to deal with these types of issues. Condensation on the Unit – A result of a poor door seal, improper heat transfer or compressor problems. Frozen Food – Usually due to a problem in the thermostat. Icing and Excess Frost in the Freezer Unit – Too much moisture is getting into the freezer unit, either because of a compressor problem or because the door isn’t sealing properly. Water Around the Bottom of the Unit or Inside the Unit – A leak can be caused by a number of things from your ice maker to the drip pan to the evaporator coils. Compressor Never Turns Off – If the compressor never turns off, it could be due to an improper seal on the unit or because the compressor needs repairs. Loud Noises from the Motor and Compressor – When the motor and compressor make loud noises together it is likely due to a specific problem in either unit. They should be inspected immediately. 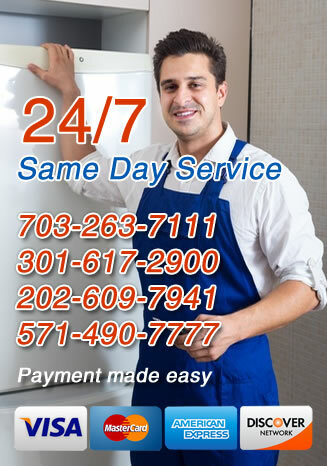 In Arlington, Virginia, Gaithersburg, MD and the surrounding areas there is only provider you can trust to get the job done right – All Time Services. Our technicians are highly trained to work with all Whirlpool refrigerator models and we’re always available for fast, emergency repairs. Call us today to learn more about what we can do for you and set up an appointment with one of our professional Whirlpool fridge repair technicians in Vriginia.